Reissue of a rare as hell LP from 1978 (reaches $500 + on Ebay) issued in micro quantity only in Corsica (a French Island located between France & Italy). 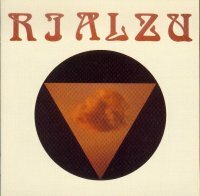 Strongly rooted into mediterranean culture, RIALZU sole recording did a highly original fusion of progressive, Corsican songs & zeuhl sounds (track 1 starts with a glimpse at Magma by playing briefly a section of KONTARKHOTZ!). Both music & vocals evoke the classic Italian progressive school (notably deep & powerful male vocals that may remind AREA). LP had 3 tracks, CD comes with bonus tracks & a short live video clip from 1977. One of the very last progressive gems from France never before issued on CD.